We study the multi-way relaying scenario with M users who want to exchange their information with each other with the help of N relays (N M) among them. There are no direct transmission channels between any two users. Particularly, all users transmit their signals to all relays in the first time slot and M − 1 relays are selected later to broadcast their mixture signals during the following M − 1 time slots to all users. Compared to the transmission with the help of single relay, the multi-way relaying scenario reduces the transmit time significantly from 2M to M time slots. K. Singh, A. Gupta, T. Ratnarajah, and M-L Ku, "A General Approach Toward Green Resource Allocation in Relay-Assisted Multiuser Communication Networks," IEEE Trans on Wireless Communications, Vol. 17, Issue 2, pp. 848-862, Feb. 2018. K. Singh, A. Gupta and T.Ratnarajah "Energy Efficient Resource Allocation for Multiuser Relay Networks," IEEE Trans on Wireless Communications, Vol. 16, Issue 2, pp. 1218-1235, Feb. 2017. K. Singh, A. Gupta and T.Ratnarajah "QoS-Driven Energy-Efficient Resource Allocation in Multiuser Amplify-and-Forward Relay Networks," IEEE Trans. 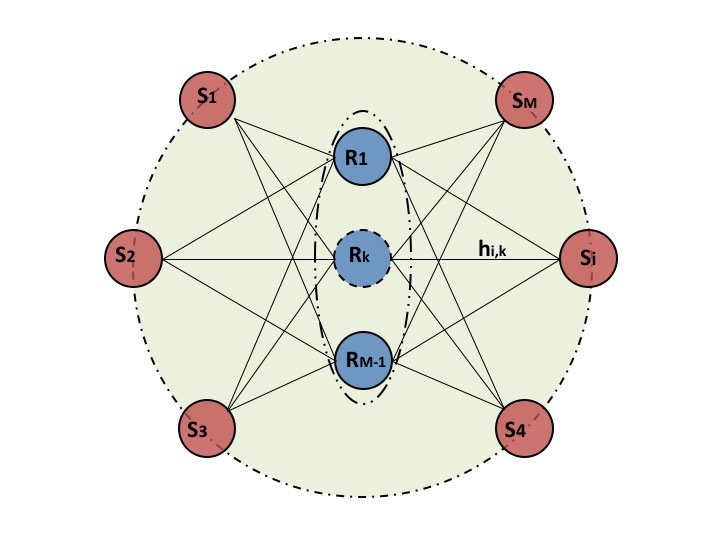 on Signal and Information Processing over Networks,Vol. 3, Issue 4, pp. 771-786, Dec. 2017. C. Zhong, M Matthaiou, G. K. Karagiannidis and T. Ratnarajah, "Generic Ergodic Capacity Bounds for Fixied-Gain AF Dual-Hop Relaying Systems", IEEE Trans on Vehicular Technology, Vol. 60, No. 8, pp. 3814-3824, Oct. 2011. Z. Ding, T. Ratnarajah and K. K. Leung, "On the Study of Network Coded AF Transmission Protocol for Wireless Multiple Access Channels," IEEE Trans. on Wireless Communications, Vol. 7, Part 2, Issue 11, pp. 4568-4574, Nov. 2008. Z. Ding, Y. Gong, T. Ratnarajah and C.F.N. Cowan, "On the performance of opportunistic cooperative wireless networks," IEEE Trans. on Communications, Vol. 56, No. 8, pp. 1236-1240, Aug. 2008.